Angel Sculptural Fountain Product Code: W006 Weight: 48 lbs (21.8 kg) Dimensions: 23″ Diameter x 47″H (58 cm x 119 cm) Made of resin Angel Sculptural Fountain. The sound of calming water music comes from on high in this angelic vision. 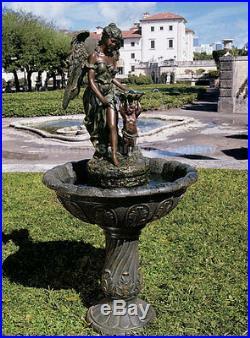 A beautiful angel gazes at the cherub at her feet in the midst of this nearly four-foot-tall, Italian-inspired fountain. Youll delight at hearing the cascading water falling into the generous acanthus leaf basin in this functional work of decorative art. Cast in 48 lbs. Of bronze verdigris-finished quality designer resin for easy assembly in home or garden, this splendid fountain features an integrated, indoor/outdoor, UL-listed pump. Finish: bronze verdigris finish THIS ITEM IS BRAND NEW! Please note that you will need to present a proof of the damage emailing us pictures is acceptable. Visit our store for more great products! Feel free to ask any questions you may have. The item “Large Winged Angel lost wax 100% bronze Sculpture Estate Garden Fountain 47″ is in sale since Wednesday, May 16, 2018. This item is in the category “Art\Art Sculptures”. The seller is “sculpture_collection” and is located in US. This item can be shipped to United States, Canada, United Kingdom, Denmark, Romania, Slovakia, Bulgaria, Czech republic, Finland, Hungary, Latvia, Lithuania, Malta, Estonia, Australia, Greece, Portugal, Cyprus, Slovenia, Japan, Sweden, South Korea, Indonesia, Taiwan, South africa, Thailand, Belgium, France, Hong Kong, Ireland, Netherlands, Poland, Spain, Italy, Germany, Austria, Israel, Mexico, New Zealand, Singapore, Norway, Saudi arabia, Ukraine, United arab emirates, Qatar, Kuwait, Bahrain, Croatia, Malaysia, Chile, Colombia, Costa rica, Panama, Trinidad and tobago, Guatemala, Honduras, Jamaica, Barbados, Bangladesh, Bermuda, Brunei darussalam, Bolivia, Ecuador, Egypt, French guiana, Guernsey, Gibraltar, Guadeloupe, Iceland, Jersey, Jordan, Cambodia, Cayman islands, Liechtenstein, Sri lanka, Luxembourg, Monaco, Macao, Martinique, Maldives, Nicaragua, Oman, Peru, Pakistan, Paraguay, Reunion.